Olentangy Berlin junior Nick Camacho (3) goes up for a shot as Kalvin Williams (32) defends for Horizon Science. Camacho scored 17 points for the Bears, who picked up their first ever home win Saturday night in Delaware. DELAWARE – When building a program from the ground up, every game provides an opportunity for a learning experience. 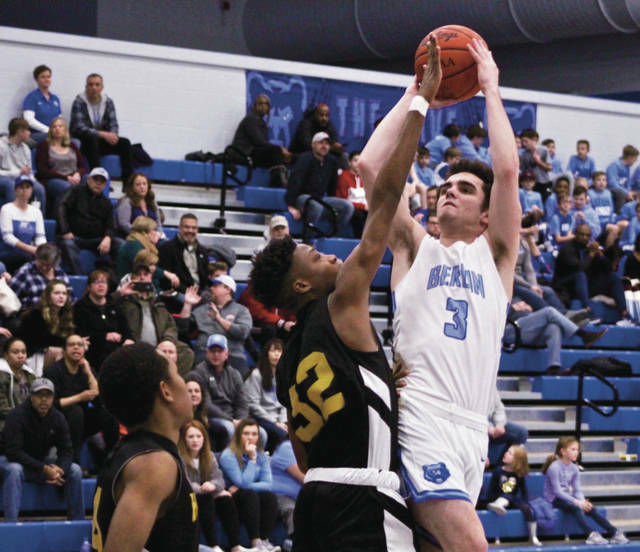 The Olentangy Berlin boys basketball team learned a couple of valuable lessons in Saturday night’s 73-65 win over visiting Horizon Science in non-league play. The Bears learned how to overcome an early deficit, using a 35-10 run to take control after falling behind by 12 early in the second quarter. They also learned what it’s like to try to hold a lead late in a close game – a test they ultimately passed to pick up their first ever home victory. Austin Corley scored 19 points, Nick Camacho added 17 and Bryce Reed finished with nine – all on 3-pointers – to lead the Bears (3-14). Jacob Moeller scored on back-to-back baskets to start the run after the Bears found themselves down 24-12 early in the second quarter. Grant Schrieber hit a 3 from the right corner and Reed followed with two more from long range – both off Corley assists to pull Berlin within one. Corley gave the Bears a 31-30 lead with 1:40 left in the half that would stand through to the break. Camacho, Corley and Zak Stevens led the Bears to 10 straight points to open the second half and Kalvin Betz hit a 3 to give Berlin a 47-34 lead to cap the run midway through the third. Corley moves at top speed all of the time. He’s even a fast-talker. Barrett is trying to get him to slow it down from ludicrous speed to warp. Corley scored the first five points of a 9-0 run to push the Bears’ lead as high as 56-40 early in the fourth quarter. The Hawks used the 3-pointer to stake them to their early lead and they used it again to keep it close late, knocking down 11 for the game. Samuel Muthama knocked down a pair from deep and Dav’ieon Quinn added a third to help HSA build a 19-10 advantage by the end of the first quarter. The Hawks hit seven in the fourth quarter alone. Jerryson Mutabirwa hit from deep three times, Quinn knocked down two more and Amario Lee added another as the Hawks pulled as close as 61-56. Quinn had a game-high 20 points, Muthama added 13 and Mutabirwa added 12 – all in the fourth quarter – to lead the Hawks (5-11). Berlin is off until Friday night when it hosts Thomas Worthington. The OCC-Cardinal contest is scheduled to start at 7:30 p.m.